In recent decades, Benalmádena has become one of the jewels of the Costa del Sol and a prime tourist destination. Its privileged climate all year round invites tourism both national and international to enjoy its wonderful beaches, its typical Andalusian labyrinthine old town, festivals and rich gastronomy. The Old town of Benalmádena is one of the most charming and emblematic places of the town. Located 3 km from the beach on top of a hill 270m high, it is this beautiful old town which consists of a maze of whitewashed houses and alleyways with colorful flowers and adorned balconies. A lovely place to discover the origins of the town. Castillo de Colomares is a giant work dedicated to Christopher Columbus and his discovery of America. The work was created by a doctor in love with art and history who fought all his life with his own hands to build this Castle of different styles, Gothic, Romanesque and Byzantine. Although it is only a recreation, it is totally worth the visit to explore this great work with their gardens, fountains and spectacular scenery. Castillo de Bill Bill is one of the most photographed places in Benalmádena. A Moorish-style castle of intense reddish located opposite one of the most beautiful beaches of Benalmádena. Perhaps you might find interesting to know that there is a Buddhist Temple in Benalmádena, reminiscent of distant countries like India or Nepal. When travelling in the Mediterranean motorway you will stumble upon this great structure 30 meters high inaugurated in 2003 in this idyllic beachfront location to accommodate all the followers of Buddhism in southern Europe. Parque de la Paloma, with over 220.000m2 is the real heart of the city and a real paradise for lovers of flowers. Benalmádena gastronomy could be defined as typically Mediterranean and Andalusian, where highlights are typical fish such as sardines, fried fish, squid, shrimp or prawns among other seafood. Also noteworthy is one of their specialties such as rice, either in the mixed paella, black rice or rice with lobster. Other dishes of the cuisine of Benalmádena that you cannot help but try when visiting the municipality are migas con leche, boquerones, jureles and salmonetes. One of the most emblematic and spectacular locations of Benalmádena is Puerto Marina de Benalmádena. A marina that has received several times the title of the best port in the world for its modern design with Arabic and Spanish style. A port visited by more than 6 million tourists to explore marina filled with luxury boats, shops, terraces, stores and restaurants. Bill Bill is one of the most popular and appreciated beaches by tourists. It is 400 m in length and is lined with a beautiful promenade dotted with palm trees and filled with bars, restaurants and terraces where you can breathe a great atmosphere during the summer months. The beach is located between the beaches of Arroyo de Miel and Santa Ana and its main feature is that it holds the famous Castle Bil Bil, a castle painted deep red Arabic style, located at one end of the beach that has become one of the symbols of the city. Playa Santa Ana is found next to the marina of Benalmádena as it gets very crowded. Along its length of 500m we find restaurants, bars and terraces to enjoy the long summer days. Playa Los Melilleros is another outstanding city beach. 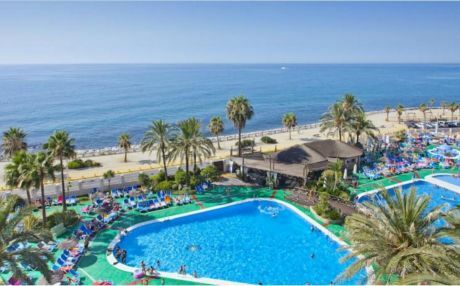 A beach with very good services and modern facilities, plus lifeguard, showers, toilets and beach bars where you can taste delicious typical food of Benalmádena. The Teleférico is one of the essential places of Benalmádena, a place where you will enjoy spectacular panoramic views of the city and the coast. On clear days, from the top you can see all the way to the African coast. During the summer months, on top of the cable car, different activities are performed such as eagles and wild birds exhibitions, as well as a show of equestrian dressage to enjoy the typical Andalusian dressage horse. If the option you want is to travel by plane, there are 2 nearby airports such as Málaga airport just 25 km away, or the Granada airport which is located 140 km from Benalmádena. At the airport you will find plenty of car rental companies in order to travel with more freedom. If you come from Málaga on the highway, the way to Benalmádena takes about 25 min. If you come from Granada, the journey takes about 1 hour and 30 minutes, where the most optimal route is to take the A92 highway to Málaga, then you need to take the A92M and A45 until reaching Málaga: from here take the A7 towards Algeciras to take the exit to Benalmádena. Benalmádena is one of the most touristic cities of the Costa del Sol and therefore has a large number of holiday homes for all tastes and budgets. Here you can choose from small studios in the city, to apartments, houses or large villas with private pools in nearby urbanizations. Just do a search on our website and find your ideal one for the whole family.